A day after a Keystone Pipeline leak spilled more than 200,000 gallons of oil in South Dakota, the pipeline operator says the incident is "controlled" and there is no risk to public safety. TransCanada Corp. said in a statement Friday that "we take this incident very seriously and are working with federal and state regulatory agencies," and has over 75 people working on the response to the leak, which was reported Thursday, in a sparsely populated area of Marshall County, near Amherst in the northeastern part of the state. A South Dakota Native American tribe said that the leak shows that a planned pipeline extension that will be voted on by Nebraska officials this week is not safe. Cheyenne River Sioux Tribal Chairman Harold Frazier says the extension, called Keystone XL, will be within three miles of the tribe's reservation. "When the Trump administration says, this pipeline is safe, it is lying. When TransCanada says the safety of the public and the environment is its top priority, it is lying," Frazier said in a statement. "They are lying to the Indian people, which is no surprise. But they are lying to the rest of America too." President Barack Obama rejected the Keystone XL project in 2015 over its potential impact on the environment. But President Donald Trump revived the project, saying construction would bring new jobs and lower energy costs among other benefits. 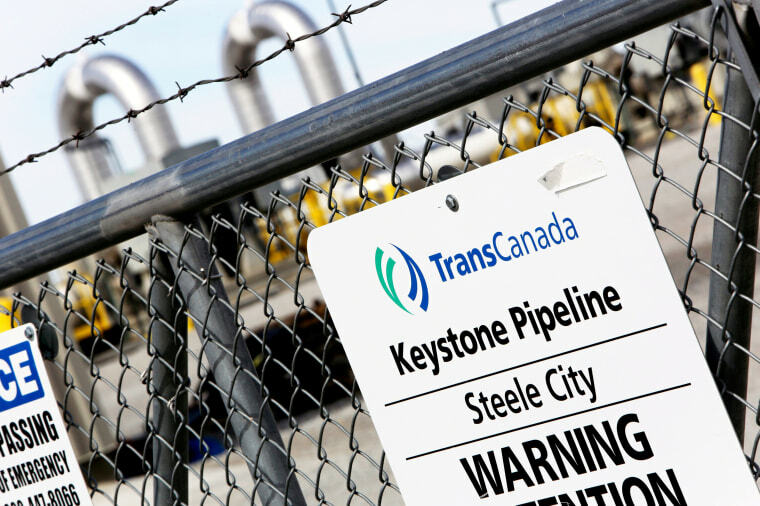 TransCanada said Thursday that it detected a drop in pressure overnight and safely shut off the stretches of pipeline within 15 minutes at about 6 a.m. (7 a.m. ET). It estimated the leak at 5,000 barrels, or about 210,000 gallons. The Keystone Pipeline system runs from Alberta, Canada, to the Gulf Coast. Another arm goes to Patoka, Illinois. The Keystone XL extension would go through parts of Montana, South Dakota and Nebraska. The Natural Resources Defense Council, one of the environmental groups who oppose it, says the XL pipeline is designed to transport tar sands oil which it called the dirtiest fossil fuel on the planet. The company said the pipeline was shut off from Hardisty in Alberta to Cushing, Oklahoma, and to Wood River and Patoka in Illinois. The southern leg of the system, which stretches to the Houston and Port Arthur areas in Texas, remained open. Thursday's leak is about 12 times the size of the last major leak on a Keystone line, in April 2016 in Hutchinson County, South Dakota. According to federal records, that leak, which was eventually blamed on a "weld anomaly," was initially reported at 4½ barrels, or 187 gallons. But five days later, it was revised to 400 barrels, or 16,800 gallons.